From radiology and anesthesia to patient needs and client education, this handy full-color guide covers everything you need to know about veterinary dentistry. Dental procedures are presented first, with chapters on oral examinations, instruments, safety, and anesthesia, followed by coverage of more difficult areas such as endodontics. The book concludes with two very interesting chapters on marketing veterinary dentistry and commonly asked client questions, replete with proper responses. With its comprehensive coverage and team approach, Animal Dentistry is the ideal resource for both technicians and practitioners alike to use in school and professional practice. "Most practices are doing dentistry on a regular basis. The veterinary nurse is at the forefront of both the preventative and the curative care...This book examines in a very practical way all of the aspects of dental hygiene, from basic anatomy and physiology, dental equipment and instruments to the more complex procedures such as radiology, surgery and restorations or orthodontics. Hopefully, after reading this book, you will not only be able to describe what exactly a 'dental' is but you will be able to easily perform most procedures." "This is a comprehensive text of 434 pages and 506 images...This text is designed to be used by both veterinarians and veterinary nurses, and the writing is clear, well ordered and comprehensive (occasionally, exhaustively so!). All photos are colour, in focus and accurate and each chapter concludes with a self-assessment worksheet...In summary, this a well-priced comprehensive, easy to read text that is suited to all members of a veterinary clinic...For those searching for a comprehensive, well-explained and very well illustrated text on veterinary dentistry for their small animal practice, this book would be a highly recommended addition to the practice library." "This book is a very well-organised introduction to the discipline of veterinary dentistry and covers the basic information required to perfrom veterinary dentistry in general practice...This book is a very useful approach for practitioners who are new to veterinary dentistry. It is also to be hoped that it will whet the appetite of many learn more of the underlying theory and, ultimately, to attend practical courses and be able to experience and practice the somewhat difficult skills described. 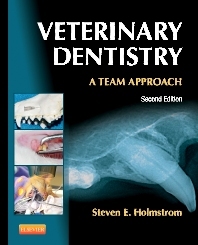 In summary, this second edition does an excellent job of covering the basics required to practice veterinary dentistry in a clear, concise and practical manner...the book is organised, an elegant means of sharing information and teaching, as well as making for easy reading." "The author is well known as an accomplished photographer and is very careful with regard to detail. This is very obvious in the selection of 506 pictures. Details are clearly visible and very few illustrations require arrows or additional notes.Construction of the book is clear and its aim to be a practical handbook fior the general practitioner wishing to provide dentistry at a good level is achieved."